Overlapping clusters on decaying hardwood tress, logs, and stumps. Cap: Pale pinkish covered with dense short, white hairs making it appear fuzzy; shell-shaped or convex; margin inrolled initially; flesh dull white with pinkish tinge. 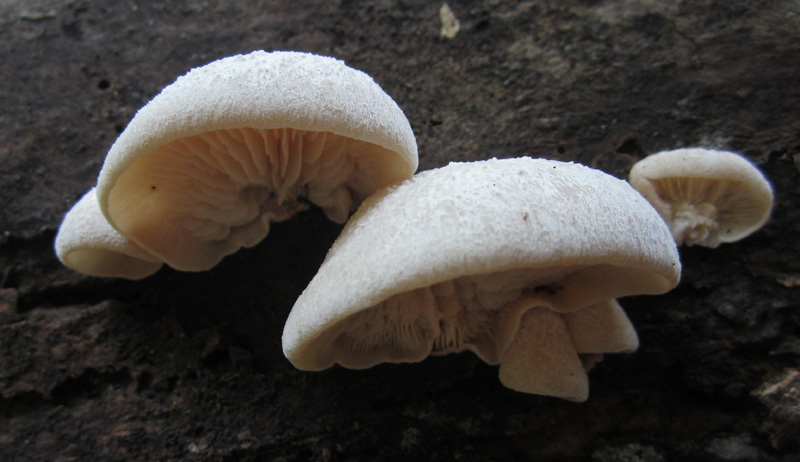 Gills: White initially, becoming pink or cinnamon in age; decurrent to attachment point; edges serrate, may appear torn; close. Stalk: Less than 5 cm or lacking; pinkish-brown; stout; tapers down; fuzzy (J. Solem, pers. comm. ).